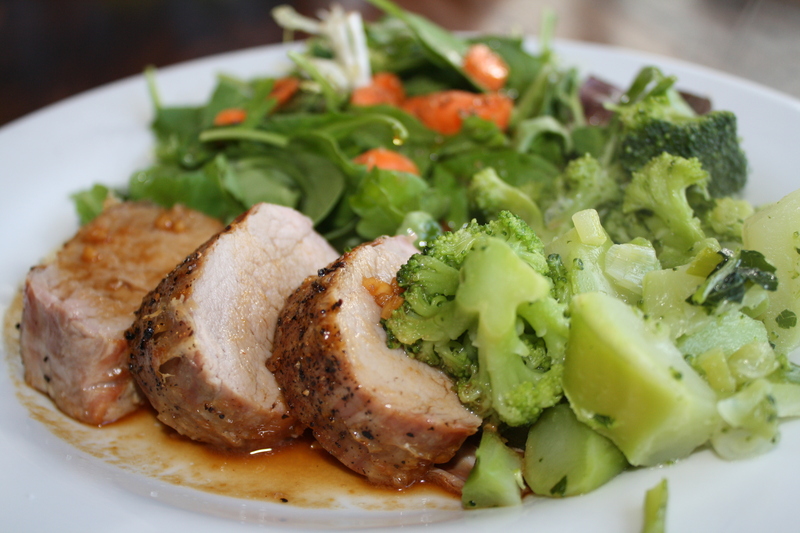 This was Monday’s recipe in my meal plan for the week, and I gotta tell ya’ll, it is one of my faves. Unfortunately, I rarely follow a recipe exactly, so I forgot to tell you about a few tweaks I made. If you haven’t tried it yet, here’s a few pointers. 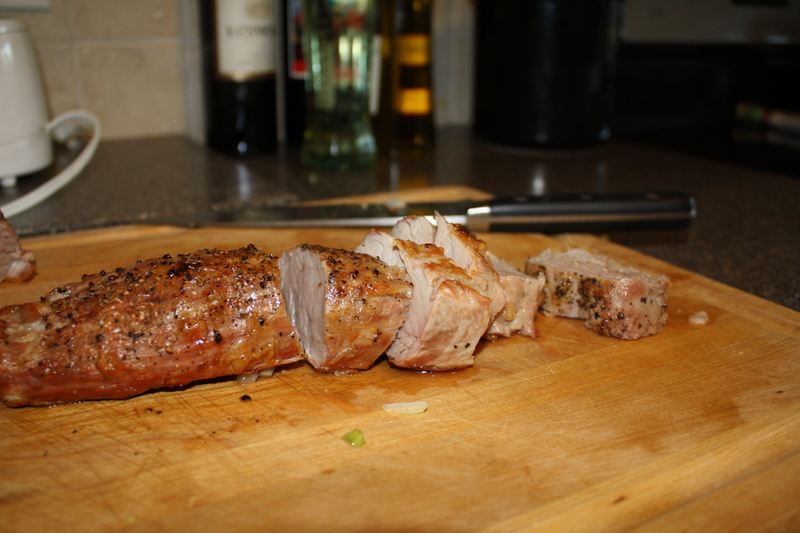 – If you bought pork tenderloin, broil it. It takes about ~8-10 minutes on each side, and it’ll have this delicious, crispy outside and perfectly tender inside. Plus, it’s way faster than the grill / oven. – I use about half the peanut butter called for in the sauce, and gently bump up the soy sauce / rice vinegar to taste. I’ve made this the original way, and it’s a little too peanut butter-y of a texture and taste. I like it to be more runny, with just a hint of the PB taste. This is also key for cutting some of the calories. I forgot I had actually made this and posted it about 2 months ago, and you can see here the thicker texture as well as thinner pork chops. 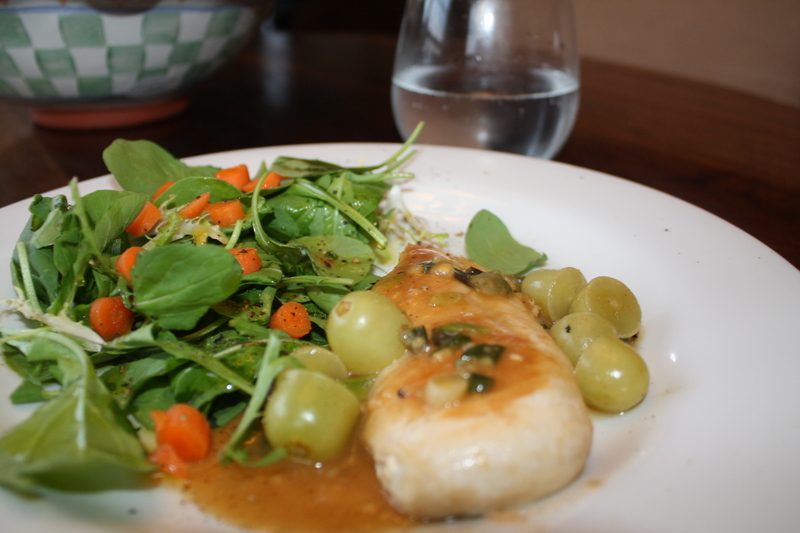 This week’s was much better… what can I say, my cooking is a work in progress! I love the sauce on this… it tastes even better the second day when the chicken has hung out in that sauce and just soaked it all up. This recipe originally came from WW “Simply the Best” cookbook, and they list the stats at 390, including the brown rice (which I did not list on the recipe). Sure beats Olive Garden’s 770 calorie version! After I made it, I decided the grapes really didn’t add much. I think I would leave them out in the future, and put mushrooms back in. What’s chicken marsala without mushrooms? I usually note in my cookbooks when I made a dish, what the reactions were, and any changes I’ve made. The last time I made this dish was actually November 26th, 2006. This is when I first start taking pictures of my food. I think I’ve come a long way in photography, as well as cooking. Here’s the original picture from nearly 3 years ago. I have no idea what setting I was using that made the dish look so…gray. Tonight, Chef Salad is still on the menu and I’m looking forward to a lighter dinner. Okay, sort of light, this salad does involve bacon and cheese. Everything in moderation, right? All credits on that title obviously go to the Zac Brown Band… one of my favorite songs of late. (Aptly named “Chicken Fried.” Creative.) I mentioned before that living in the South means lots and lots of fried food. It took me forever to realize that when someone mentioned “seasonings” in their green beans, they ain’t talking Mrs. Dash. So, one of the biggest challenges I’ve had as a weight loss coach is introducing people with “seasoned” palates to new and tasty alternatives and convincing them that healthy can be yummy. When I got this month’s Everyday Food magazine, I knew right the first recipe I wanted to try was the Oven Fried Chicken. I’ve done other variations of this but it never turns out with that juicy flavor that I know those who love tried&true fried crave. This one started with a buttermilk marinade, so I had high hopes for it being a little more authentic. I only used my olive oil spritzer on the crumbs and tossed them before baking. I also used boneless, skinless chicken breast and powdered buttermilk (add water) – just because that’s what I happened to have on hand. Pantry Staples. (Erm, Freezer Staples, too.) Good Stuff.